If you have one person telling you that, you think to yourself, 'OK, one person said that, so it must be pretty huge.' If you have 50 people telling you that same thing, that's something else. You couldn't help but get a little worried after hearing so many people talk about STAR TREK. But, in reality, it was nothing like that, especially here on the set." When STAR TREK: VOYAGER debuted in January, Kes was something a mystery character. Once merely the girl friend of Neelix (Ethan Phillips), the ship's Talaxian handyman, her role slowly but steadily evolved. Viewers learned of Kes' burgeoning telepathic powers, watched her relationship with Neelix deepen and were intrigued by the personal and professional possibilities raised by Kes' friendship with the Doctor (Robert Picardo) and her new status as his assistant. For a one-year-old Ocampa, whose tunnel-dwelling people have a lifespan of only nine years, traveling aboard the U.S.S. Voyager offers a universe of amazing experiences. "Kes is such an innocent in many ways. She's on a constant trip of discovery," explains Lien, as she relaxes in her trailer on the Paramount lot before the mid-afternoon start of her day. In an hour or so, her long and curly blonde hair will be buried beneath Kes' wig and Lien's overalls and sneakers will be replaced by her STAR TREK: VOYAGER uniform. Portraying a character such as Kes, to whom everything that happens to and around her is a fresh and stimulating experience, is both exciting and challenging for the 20-year-old actress. "Oh, God. That's the best part of all this, and it should always be that way, with any role you play," enthuses Lien. "I cannot tell you how freeing it is to play Kes. That's why among other reasons, I'm elated to be on the show. Right now, I'm getting excited just talking about it. Everything is new to Kes. She's seeing it all for the first time. It's all wondrous and different for her, and I love playing that." As for the unique Ocampa lifespan that STAR TREK: VOYAGER creators Rick Berman, Michael Piller and Jeri Taylor weaved into the character's backstory, Lien reports that it really hasn't yet come into play. "I don't think it's an issue for her, to be honest, at this point. It could be an issue when she's seven or eight years old, but I can't even say for sure that it will or won't be an issue then, either, because I'm not a writer," she notes, "However, from the way I think Kes is drawn in the show, there's really no room in her life, in her spirit or her mind, for worrying about death. "Her attitude is, 'Why should I think about death when there are so many other more positive things to think about.' There's a comfort, actually, in being able to understand that. Time is a relative thing. Yes, she only has a nine-year lifespan, but that's all she has ever known. She accepts it. She accepts it the way we, as humans, know that we'll probably die before we hit 100. We can't wake up and think, 'I've only got another 80 years to live!" You can't think that way, and Kes definitely doesn't think that way." Lien describes the Ocampa as very intelligent, very curious, words that also seem to perfectly define Kes. Some might even argue that Kes is often too curious for her own good. If curiosity kills the cat, what might it someday do to Kes? Lien smiles. "Kes is a free thinker. I think the appetite for knowledge and the sense of curiosity that accompanies that is just incredible. So, in the pilot, once Kes realized what was above ground, she asked, 'Why? Why can't we go? It's there.' Sometimes," argues the actress, "things happen and we don't know why they do. It's natural to ask why it happened, don't you think? Not everyone will question things. That's why you are who you are and why I am who I am. And that's why Kes is who she is. She is curious, but she can't really say, 'Why am I curious?' She just is. What can she do about it?". Another matter apparently out of Kes' control is the love and affection she feels toward Neelix. Over such episodes as the "Caretaker" pilot, "Time and Again", "Phage" and the "Cloud", viewers have had the opportunity to watch the unlikely duo grow closer. Though Neelix often comes across as an advice-spouting father figure, the couple definitely seems to thrive on their compatibility, the give and take nature of their conversation, and their mutual attraction for one another. "They're a team, sort of," suggests Lien. "The relationship between them is unique. Everyone is interested in seeing how it will develop. I'm not sure myself. Neelix is very, very jealous. So, the writers might get some sort of a jealousy angle with Neelix, Kes, Paris and the Doctor. Right now, they love each other very much and they have a good time together." "I think it also helps that they're both not from Starfleet. They're two people who said, 'Hey, we want to join you.' They have a different perspective on things. They're a huge part of the team, of the crew now, but they come from another place. Thay can share their experience in a different way from everyone else, which gives them something in common. I'm so lucky that so many of my scenes are with Ethan, He's such an incredibly talented guy, really great and so funny. He's always making us laugh. It's the best possible situation for an actress to play opposite him." When it comes to Kes' relationship with the other members of the starship crew, there is precious little for Lien to say, for Kes hasn't had much in the way of bondbuilding scenes with most of the other characters thus far in the show's run. That doesn't mean, however, that the actress hasn't formed definite, positive opinions about her co-stars. "Kes is sharing her understanding of humans, of human-ness, of all the good things she has learned about them, with the Doctor and he is sharing his knowledge of medicine with her. She's a student and he is the teacher. There's also a strong friendship there, so there are strong feelings," she explains. 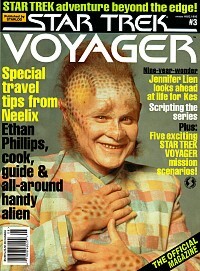 "I'm not sure, though, that there will ever be any type of relationship change that would validate Neelix's jealousy. Kes has a great deal of respect for Captain Janeway and I hope we'll see more scenes with them together. Kes really doesn't know everyone else as well yet because she hasn't spent much time with them. "I've gotten a chance to know everybody in the cast on a personal level, and we have a great team here. I'm really lucky to be involved with this group of people. Everybody has been telling me how rare this is and how fortunate we are that all of the cast members get along like we do. We work so well together, every day. I'm very thankful for that. I don't take any of that for granted. We all realize that this is something very special and that we must take care of it." "This is the biggest show I've ever done, by far. It's like being in a candy store. I realized, but I had never seen it first-hand, the amount of dedication that everybody, not just the cast, but everybody involved with the show brings. Here," she continues, "you can't help but notice that dedication because everything that everybody does is such an intregal part of the show and of the finished product. The actors do their job and then so many other people have to do their jobs to make it all work. It's a huge group effort, and I like being a part of this group." An Illinois native, Lien explains that it was always her goal to act. By age 13, she was already performing on stage at various festivals in such productions as Othello and The Tempest. Not long after, she made her television debut, appearing in an episode of the short-lived Oprah Winfrey drama Brewster Place. In 1990, Lien relocated to New York City in order to appear as a regular on the popular soap opera Another World. She played the misfit orphan Hannah for nearly two seasons, but wasn't on the show at the same time as STAR TREK: VOYAGER co-star Roxann Biggs-Dawson, who had acted on the soap a few years earlier. Lien also did some voice work, interacting with Adam Sandler on a comedy album by the Saturday Night Live star and providing the dulcet tomes of a B-movie star on whom Jon Lovitz's movie reviewer character had a crush in an episode of the animated series The Critic. The television season prior to STAR TREK: VOYAGER, Lien was also a regular on the tennis-themed ABC sitcom Phenom. "I never really questioned what I wanted to do with my life. Acting is just something that I always liked to do. Acting lets you tap into the imagination, into diffrent worlds, especially here on VOYAGER. It's just an incredible art form," she states. "I've always loved it, but I don't analyze it and I don't ask why. I'm very, very fortunate that I knew what I wanted to do when I was younger. It's a true statistic that more than half of the population in the world doesn't enjoy their jobs. That's really sad and depressing." "There are things you just have to do every day, hours you have to spend in order to eat, to live, to clothe yourself, to socialize, to have children. To not enjoy what you do in order to do all of that is really a shame. So, I consider myself very lucky because I love acting and, also, because people have responded to me, to my acting. That means, hopefully, that I can keep on acting." And what kind of reaction has Lien ben getting from the millions of STAR TREK fans who tune in to the series every week? "I've gotten some fan mail. I've met some of the fans. A few peoples, not many, actually, have recognized me on the street or in a store. That kind of thing is part of the package, part of the bigness of STAR TREK that we were talking about. None of it has crushed me yet. People keep saying, 'Just you wait, just wait.' There really hasn't been anything for me to be defensive or nervous about. I know the fans take what we do very seriously. That's part of the enthusiasm of the fans and it's a very large part of the show's success, I think. These people care about STAR TREK and they want to get to know us. I respect that. I've been asked to do a few conventions, but I haven't done any yet. I probably will, eventually. Anyway, the fans seem to be very pleased with the show and I think they like Kes, so that makes me very happy." Finally, there's the matter of acting on STAR TREK: VOYAGER and portraying Kes well into the foreseeable future, should the show's ratings remain strong. Jennifer Lien smiles as she collects her thoughts. "Could I play Kes for five or six years if the show stays on that long? That's an interesting question. Yeah," the actress decides after a moment's pause, "I can. You know why? Because I'm having so much fun, I'm so challenged by my character, and I like the people I'm working with here so much. If that all continues, this will go by so quickly - just like that. I could see that definitely. You know what would be interesting? To have this conversation five or six years from now. Will I feel the same way? I hope so. And I think I will."